Pin It Disasters and emergencies can be very stressful for both the parents and the children, which can leave a lasting impact on a person's life. Surviving an emergency or a natural disaster sometimes has more to do with meeting your emotional and psychological needs than just meeting your physical needs. How do you prepare to meet your needs in emergency situations? Having something that will help you take your mind off of the surrounding circumstances. A deck of cards can be a compact and simple way to help you prepare for difficult situations, but what about little children? What can you have in your emergency kit that will help the little ones stay busy and entertained? 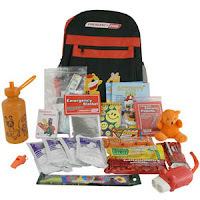 Emergency Zone's Children's Emergency Kit comes with an activity pack for kids. It contains items like coloring books, crayons, teddy bear, note pad and a pencil. Remember, surviving an emergency is not just meeting your physical needs, but also your emotional and psychological needs. When putting your 72 hour kits together, keep in mind your children and what you can do to help them make it through difficult times. You are absolutely correct about children having special needs. Don't forget that they also need their own light source, even a light stick will do for the short term. As in the picture above, a small warm and fuzzy such as a teddy bear is essential. The child gains comfort from having it and becomes stronger as they, in their own minds, comforts the bear. And lastly, be sure to include special food items for both nutritional reasons and for comfort so the shock factor is reduced as much as possible.